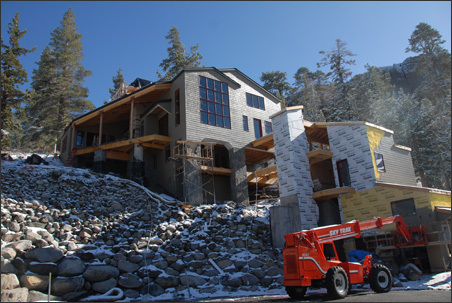 This house at the Kirkwood ski resort near Lake Tahoe sits at the end of a cul-de-sac, on a steeply ascending upslope. The site challenged us to place the parking garage level with the road, then to set the house up on the hill for the best views and access to the sun. Our solution was a two-building design, with the garage and potential rental unit in the lower building, linked to the upper main building with a bridge. 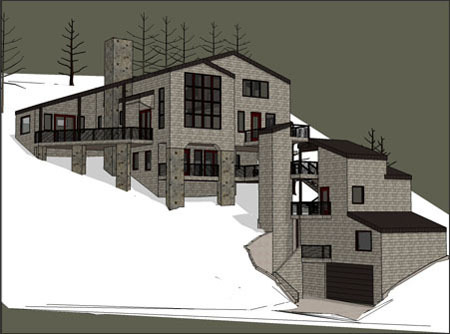 The main materials of the complex are stone at the base, vertical wood siding on the walls and metal roofing. Thus, the house has a contemporary design using traditional materials.